We're all guilty of talking about the weather. No matter what, you always need to know if it's raining, if it's hot, if it's windy. 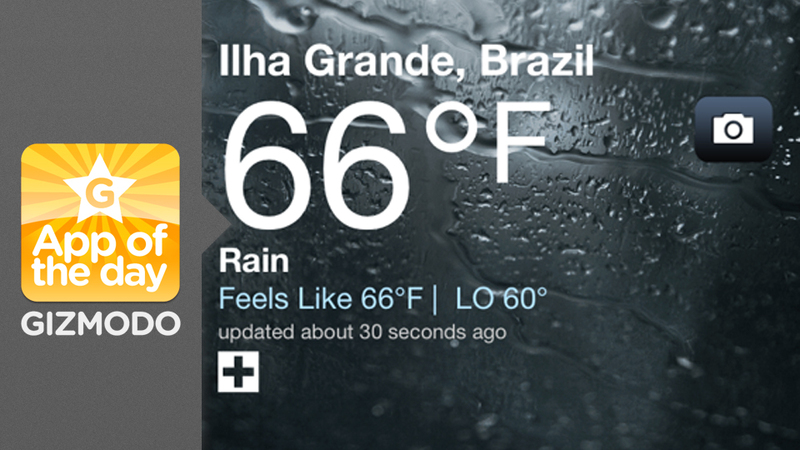 This is why the Weather Channel is the fifth most-downloaded iPhone app of all-time. Arriving today is a new-and-improved version. It answers all the questions you want answers to, with the current outdoor conditions displayed on the wallpaper. Temperature is prominently displayed in the middle of the page, and the features you're familiar with are still there there — if you want to check out the forecast for the weekend, the next 36 hours, or the next 10 days, you can do so from a menu at the bottom. It will also automatically import cities you have saved in Apple's default weather app in case you want to see if it's just as hot in your hometown as it is where you live. The update has made the app more visually appealing and much easier to use. The radar map is more accessible, so you can see what kind of weather is headed to your area. The app is also now integrated with your phone's camera, so you can post a picture of, say, golf ball-sized hail in your front yard to Facebook, Twitter, the Weather Channel or send it to someone via email. Added social media integration will also keep you up to snuff on what mother nature is up to.